We're southernizin' a classic Spanish sauce by substituting the traditional roasted almonds or pine nuts with pecans. We're serving our Romesco over grilled asparagus, but it can be used for any seafood, meat, or vegetable you like. Or if you want, you can drink it with a straw—we won't judge. Roast the red peppers on the grill until they blister and let cool before peeling skin away. Toast the pecans over medium heat in a pan—they're done when you can smell their essential oils. In a blender, pulse the ingredients together, and then blend while slowly adding olive oil. 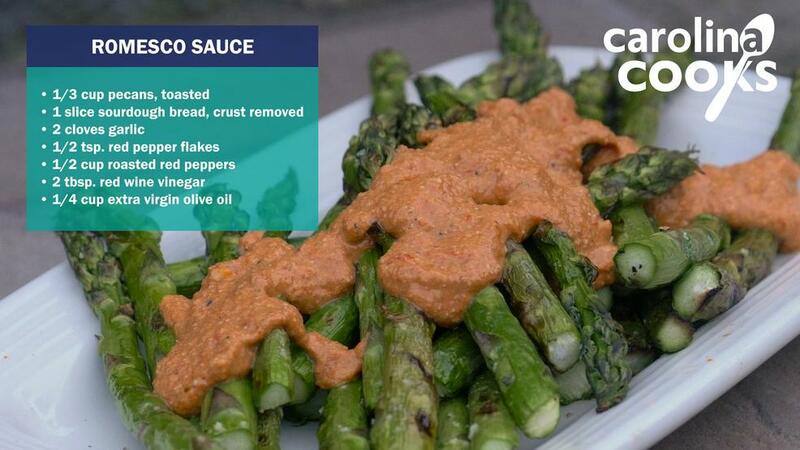 Follow Carolina Cooks on Twitter and let us know how your Romesco sauce turned out!